Yes, that is right. 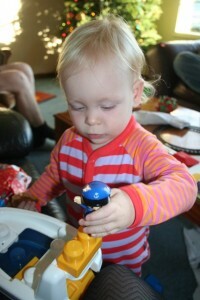 Just in time for celebrating invasion / Australia day, you as an 18month old have expressed decidedly bogan sentiments. “Bogan?”, you say, “What is Bogan??”. Bogan is when you spot a man walking towards us as we leave the pool. You look up at him in awe as you chomp down on your peanut butter sandwich, as wandering back and forth across the path as you are struck by his larger than life physique (read: a totally ripped model-like youthful male who was part of the cast of a new television show being filmed at our local pool on the day you have lessons, hulking towards us up the path as I attempt to avert my eyes and pretend there isn’t someone obviously swaggering with self-important almost narcissistic body-pride near me and my 1.5 year old with no-one else in sight). ” Man, Man”. Then, pointing at his torso, “Star, star”. So I have to look. 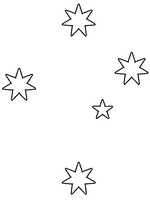 And yes, across this young man’s torso is emblazoned the now-synonymous-with-bogandom tattoo: the Southern Cross. Nothing extreme there. Just observant, I think. But what happens next is what makes you my little bogan. ps. wikipedia’s take on bogan.. When your Grandma K asked what you would like for your birthday last year, I asked that she get you a baby doll. As I figured no-one else would want to give you one (as you’re a boy and most people stick to gender-specific gifts even when they know kids of all persuasions like to play with a variey of toys). And I knew she would oblige. so my new kitchen is NEARLY all done (just the splashbacks), so over the past week since we got back I’ve been unpacking kitchen boxes in addition to unpacking from the holidays. How does one accumulate so much stuff for one kitchen. Anyway, I found my favoured appliance yesterday in the second-last box. Yes, the second-last (hallelujah!). Have you guessed what it is?? Some previous posts might alert you: Grumpy and Emotional or the following, It’s your dad’s birthday…. Yes, it is my icecream maker. Yay. 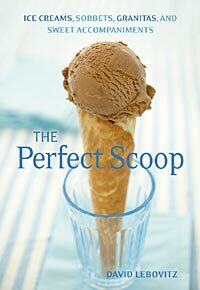 And I got what I wanted for Christmas: a copy of David Lebovitz’s the The Perfect Scoop . 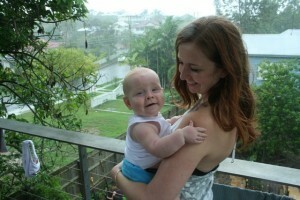 Little O you are oblivious to the floods and the weird situation in Brisbane at the moment. We arrived back from Vancouver this afternoon and with the assistance of your uncles J & J and Grandad (due to the volume of luggage we had in total), you, me, your dad, your Canadian grandpa and grandma trained from the airport to a local station and then did multiple car trips to make it home as it was unclear if we would make it by car. So here we are at Vancouver airport, about to board a flight to Australia but not sure if we’ll make it home to our house in Brisbane as the worst floods since 1884 or some such time are expected tomorrow and the following day..
You just told us ‘Poo, poo, hand, hand’ as you dragged your Dad into the bathroom in our hotel room. And then proceeded to do a large poo in the toilet and say, ‘all done’ when you were finished. So this is our third day up at Big White ski resort here in Canada. 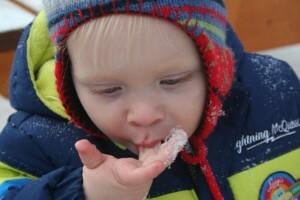 And you still seem to love the snow. Mostly eating it! It’s the afternoon of New Year’s Eve and I’ve been reading other blog posts reflecting on the year past and talking about aims for the future. I try to recall all that has happened in the past year and I’m stumped. Baby brain has extended into toddler brain. Or maybe I’m just getting older. Rephrase. Maybe my age and former life and brain degradation due to former life is finally catching up with me :). All good though – I’m generally happy with where I’m at, where we are at as a family, and with life in general. 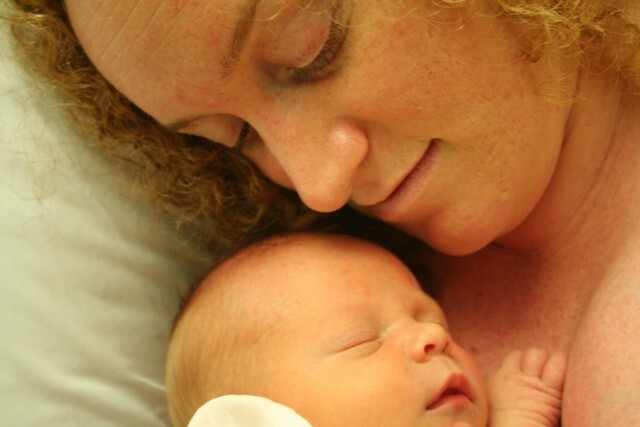 your Dad and I had a busy and up and down year – having a new business, a new baby, adjusting to life with a baby, back in Brisbane, with family and friends and did I mention a new baby? All is well, we’ve learned to communicate better about some things most of the time, we’ve had a few blowouts, but all in all I think if anything we are closer and happier than ever (thank-you C, I love you!). The date-a-month by ourselves concept hasn’t quite worked out – perhaps we can aim for that in the new year with renewed vigour (sisters and grandparents we’re looking at you here – thx in advance!). work. work. Your dad worked hard. I worked hard two days a week from April. You went to daycare and settled right in. Enough said. I finally got it together and got a new kitchen organised and in. Just in time to get the worst case of tonsilitus ever (was out in bed for a week and they thought I had glandular, thankfully I didn’t) and thus not be able to use it before our Christmas holiday. 2011 to be the year of new kitchen breaking-in then. Bring it on, we’re ready!